New Delhi: With the rising medical negligence cases against medical practitioners, doctors (surgeons and physicians) being subjected to criminal prosecution are at an all time high. The criminal process once initiated subjects the medical professional to serious embarrassment and harassment. Later, even if they may be exonerated by acquittal or discharge but the loss which he has suffered in his reputation cannot be compensated by any standards. Keeping this in mind, Medical Council of India is soon going to lay down Guidelines for protecting Doctors from Frivolous or Unjust Prosecution Against Medical Negligence. 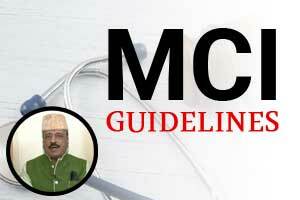 It is reported that a Study Group was appointed under the Chairmanship of Prof. Dr Ved Prakash Mishra, Chaiman Academic Committee of the Medical Council of India (MCI), to make the draft guidelines whose recommendations have been now accepted by the Executive committee and the General Body of the MCI. The Prosecuting Agency on receipt of any complaint of which criminal rashness or negligence is an ingredient against a registered medical practitioner under the Indian Medical Council Act, 1956 prior to making arrest refer the complaint to the Chief Medical Officer of a District who shall place it before the District Medical Board for its recommendations as regards the merit of the allegations of criminal rashness or negligence, contained in the complaint. The District Medical Board on receipt of such a reference examine the allegation contained therein within two-weeksfrom the date of its receipt and forward its recommendation to the Prosecuting Agency through the Chief Medical Officer of the District. The District Medical Board that has examined the complaint must ensure a Doctor qualified in that branch of medical science is part of the Board. The Prosecuting Agency, in case, it is dissatisfied with the recommendation of the District Medical Board may by stating the reasons for such dissatisfaction refer the matter to the State Medical Board for its recommendation within a period of two weeks from the date of receipt of recommendation of the District Medical Board. The State Medical Board, on receipt of any such reference from the Prosecuting Agency would examine the matter within a period of two-weeks from the date of receipt of such reference. The State Medical Board shall provide reason for endorsing or rejecting the recommendation of the Divisional (District) Medical Board. The Prosecuting Agency on the receipt of Recommendation of the District/State Medical Board may further proceed in the matter in accordance with law. However, in case arrest of a registered medical practitioner in the employment of State/Central Government is being made, the Controlling Officer of such Medical Practitioner would be informed by the Prosecuting Agency. Likewise, in case, the registered medical practitioner is engaged in private practice, the concerned State Medical Council, or in case there is no State Medical Council in that State/Union Territory, the Medical Council of India be informed. All those are into only private practice should INSIST GOVERNMENT to ban private practice by the GOVERNMENT DOCTORS. BECAUSE of such GREADY GOVERNMENT DOCTORS , PRIVATE PRACTICE OF THE FULLY COMMITTED PRIVATE DOCTOR\’S ARE AFFECTNG ADVERSELY. UNLESS YOU WORK , YOU WON\’T GET A SINGLE. PENNY. YOUR FAMILY DEPENDENS UPON SOLELY ON YOUR EARNINGS. STARRING FROM WATER YOU HAVE SPEND YOUR OWN HARD-EARNED MONEY WITH OUT ANY HOLIDAYS. THE DAY YOU MISS YOUR PRACTICE , YOU LOSE MONEY , UNLIKE THE GOVERNMENT DOCTORS. SUCH suggestion given ACCADAMIC BOARD OF MCI IS INTO PRACTICE IN EUROPE OVER THE DECADES. THATS WHY WE FOR BEHIND AND OUR HEALTH CARE SYSTEM IS AT 145 POSITION , AT THE BOTTOM HALF PAR BELOW THE COUNTRIES LIKE SRILAKA, NEPAL AND BHUTAN. HARDLY 15% OF THE INDIAN ARE GETTING PRIMARY HEALTH CARE FROM THE GOVERNMENT . UNLESS AND UNTIL HEALTH CARE SYSTEM IS GOVERNED BY THE PROFESSIONALS KEEPING AWAY FROM THE CLUTCHES OF THE BABUS THE BUREAUCRACTES , THINGS ARE MORE LIKELY TO DETORIATE . HARDLY 20 % OF MONEY SPENT FOR BENIFIT OF THE PATIENTS IN GOVERNMENT HOSPITALS. THE NEED OF THE HOUR IS \” BABU MUKTH BHARATH\” \”PROFESSIONALS YUKTH INDIA\”. HOW ABOUT GOVERNMENT DOCTORS , SOON AFTER ATTENDENCE DISAPPEAR TO THEIR PRIVATE PRACTICE. SUCH GUYS ARE MORE LIKELY TO BE NEGLIGENT. THEY HAVE BETTER ADVANTAGE. HAVING ADVANTAGE OF GOVERNMENT DOCTOR AS WELL AS A PRACTICNER . THEY EVEN SYPHON OUT PAYING CASES TO THEIR PRIVATE PRACTICE/ ESTABLISHMENTS. ( NURSING HOMES, HOSPITALS, LABORATORIES, X- RAY AND SCANNING CENTRES, CHEMIST OF THEIR CHOICE . DAYING CASES FROM THEIR PVT ESTABLISHMENT SWIFTED GOVERNMENT HOSPITALS ) . THEY FREE LABOUR IN GOVERNMENT HOSPITALS . EVEN POLITICIANS SUPPORT SUCH DOCTORS, THEY LINE UP INAGURATE THEIR PRIVATE ESTABLISHMENTS . UNLIKE IN A PRIVATE SET UP , THE GOVERNMENT DOCS GET PLEANTY OF LEAVES – 54 SUNDAYS, + 27 SECOND SATURDAYS+ 30 DAYS LEAVE SURRENDER+ MEETINGS + SPECIAL DUTIES + 24 DAYS GENRAL HOLIDAYS+ SICK LEAVE + MATERNITY + PATERNITY + VOTING + TO ATTEND COURT CASES + VIP DUTIES( GANDHI leavs). . THAT MEANS HARDLY THEY WORK AS A TRUE PROFESSIONALS FOR 150 TO 200 DAYS. STILL GET ALL THE BENIFITS . WHERE AS THOSE WHO ARE TRUELY COMITED INTO PRIVATE PRACTICE HAVE TO SLOG DAY IN DAY OUT. ONLY BY WORK THEY GET MONEY . THEY WORK MORE THAN 12 HOURS / DAY ( 12X365). STARTING FROM HELPER TO NURSE AND OTHER SUPPORTING STAFF THEY HAVE TO PAY . AGAIN THE RENT , ELECTRIC , WATER BILLS AND WAHT NOT . WHERE AS IN GOVERNMENT EVERY THING COMES FREE. ZINDAGI SATBI , ZINDAGI KA BADNI PAISA ATHAHAI. THE QUALITY OF TREATMENT IS SO POOR , OR SUBSTANDARD , NON OF THE BABUS THE BUREAUCRACTES OR THEIR BOSSES GET ADMITTED IN A GOVERNMENT HOSPITALS. I HAVE YET SEE ANY DC , SP , MAGISTRATE ,JUDGE, CEO MLA , MLC, MP OR A MINISTER GOT ADMISSION IN A GOVERNMENT HOSPITALS . ISN\’T SHAME , I WOULD LIKE CALL IT A NATIONAL SHAME . DISRESPECT TO THE VERY GOVERNMENT. DO WE REALLY NEED SUCH GOVERNMENT HOSPITALS ???. The situation of GOVERNMENT teaching medical colleges are much worse, the so called TEACHERS better advantage to run away to their private practice leaving opds and ward work to the illtrained house surgeons, residents. Students are happy as long as they given attendence and ASSESSMENT MARKS AND PASSING them in the university practical exams. MY SUGGESTION TO IMPLEMENT / IMPOSE BLANKET BAN ON PRIVATE PRACTICE BY THE GOVERNMENT DOCTORS ALL OVER THE COUNTRY. AND ALSO TO TEACHING FACULTY MEMBERS OF THE MEDICAL COLLEGES IRRESPECTIVE WHETHER THEY ARE PRIVATE OR GOVERNMENT . Follow rules they it is followed by INDIAN Army and other central government hospitals. What about the patient load in the Government Hospitals? The frivolous complainant or the over enthusiastic I/O or prosecuting officer must not be immune to sec 167, sec 211 and sec 120B of IPC in the plea of discharging his duty. Besides the sec 167 IPC should be amended to make it cognigeble too. What are those sections it will be nice if you narrate it\’s importance. There is always a \”conflict of interest between Govt Doctors and private medical practitioners. How can this be addressed satisfactyorily? Banning of private practice of the GOVERNMENT DOCTORS is the right answer for majority of our healthcare related problems. NATION FIRST\’ PRIVATE PRACTICE LEAST/ LOST / LAST.